Sheet: 25.65" x 26.65", Design: 22.65" x 22.65"
Tile Stencils are all the rage in today's DIY decorating! Just look at the savings when you don’t have to gut your existing tiles! Our intricate Alatera Tile Stencil pattern is a great money saving alternative to the popular but pricey cement floor tiles, and it also looks great stenciled on walls. 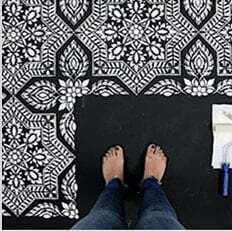 You can even stencil this beautiful pattern on an ugly linoleum floor! Just make sure to use the right paints for proper adhesion. Learn How to stencil a tile floor - it’s so easy! Note that this stencil is designed to be used as a continuous floor pattern and might not fit precisely into your existing tiles.